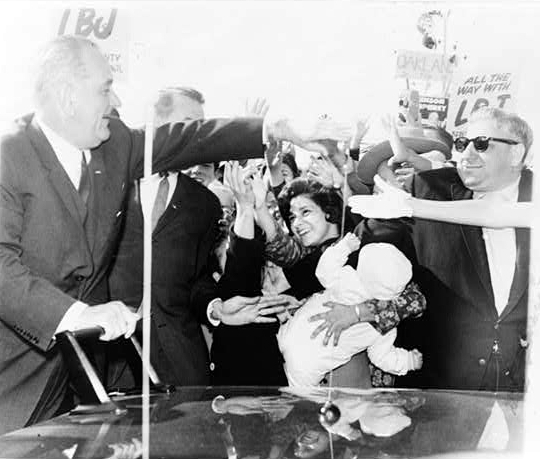 Lyndon Johnson campaigns, Library of Congress. With the November 2014 midterm elections less than a month away, it’s useful to view political events in historical context. Will the president’s party lose seats, as is typical in a midterm election in a second term? Sometimes circumstances and events break the norm. In the 1970s and 1960s, there were no midterms held in the second full term of any president. Elected in 1976, Jimmy Carter was a one-term president who never reached a sixth year. The Republicans gained 15 seats in the House and three in the Senate during the 1978 Congressional elections in Carter’s only term. Likewise, Gerald Ford became president in Nixon’s sixth year, just before what would have been Nixon’s second term midterms. The Watergate scandal led Nixon to resign on August 8, 1974. Ford pardoned him a month later. Hence, the American people overwhelmingly voted Democrat in the November 1974 midterms, with the Democrats gaining 49 seats in the U.S. House and three in the U.S. Senate. John F. Kennedy was assassinated in his first term, making Lyndon Johnson president in 1963. He won election in his own right in 1964. Two years later the Republicans gained 47 seats in the House and three in the Senate in the 1966 midterms. Johnson’s fifth year in office took place during the presidential election year of 1968. With the war in Vietnam a disaster, Johnson decided not run for re-election. Richard Nixon won the presidency in 1968, while the Republicans gained three seats in the U.S. House, five seats in the Senate, and another Senate seat in a special election. Though first term midterm elections took place, no president in the 1960s or 1970s held a typical second term in office. This entry was posted in History, Politics and tagged #TBT, Gerald Ford, Jimmy Carter, Lyndon Johnson, midterm, midterm elections, Richard Nixon. Bookmark the permalink.